On one side, a parliament of owls keeps watch beneath a twinkling night sky. On the reverse, a collection of spells—turn palms up and read Expecto Patronum! Accio Wand! Incendio! Quietus! and more. 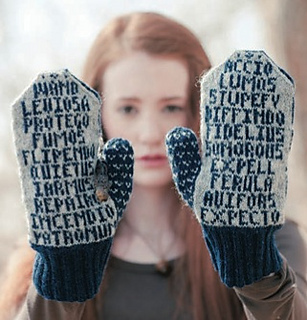 These mittens are a handy reference for any wizard on the go, and an essential study tool for any fifth-year student at Hogwarts hoping to pass the Ordinary Wizarding Level exams! 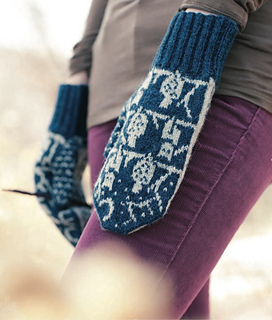 Knitted in stranded colorwork using a warm Shetland wool and sized for adults in small, medium, and large, this is a great project for practicing two-handed colorwork and experimenting with yarn dominance. Note: Mittens are sized by adjusting needle size and gauge. Finished Size: 7.5 (8, 8.5)“ hand circumference and 9.75 (10.25, 10.75)” long. 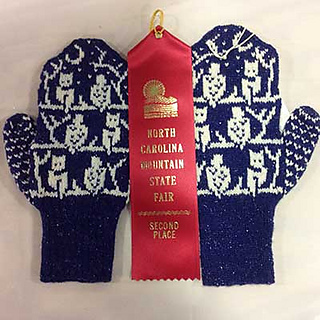 Mittens shown measure 8”. Yarn: Harrisville Designs Shetland (100% virgin wool; 217 yd 198 m/1.75 oz 50 g): midnight blue (MC), 1 (1, 2) skeins; silver mist (CC), 1 (1, 1) skein. Needles: Size 1 (11⁄2, 2) 2.25 (2.5, 2.75 mm): set of 5 double- pointed (dpn). Adjust needle size if necessary to obtain the correct gauge. Gauge: 39 (37, 35) sts and 44 (41, 38) rounds = 4” in charted pattern. With thanks to dgerish for catching two small errors on the spelling of spells: Reparo, not Repairo, and Sonorus, not Sonorous.